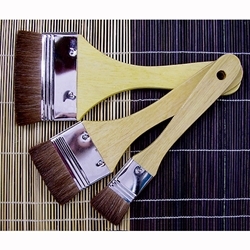 Royal & Langnickel Large Area Artist Brush Set - Three Brown Camel Hair Brushes - These extra soft, natural hair brushes are perfect for blending and softening faux finishes, watercolor washes and techniques, and soft strokes and highlighting colors. They also make ideal gold leaf application brushes. The set includes one brush each in sizes 1, 2, and 3 inch.